The story of your birth begins many months before you actually began your journey out into the world. When I was about 5 months pregnant with you, your Abba and I enrolled in a 12-week Bradley Childbirth class. Although my parents had taken Bradley classes with me 30 years ago, I wasn’t particularly committed to a drug-free birth, even though that’s Bradley’s thing. I didn’t feel that I had anything to prove to myself or the world by having a natural birth – I just didn’t want to be in horrible pain. This was my mindset when we started class. The morning is full of hope, and this morning especially so. 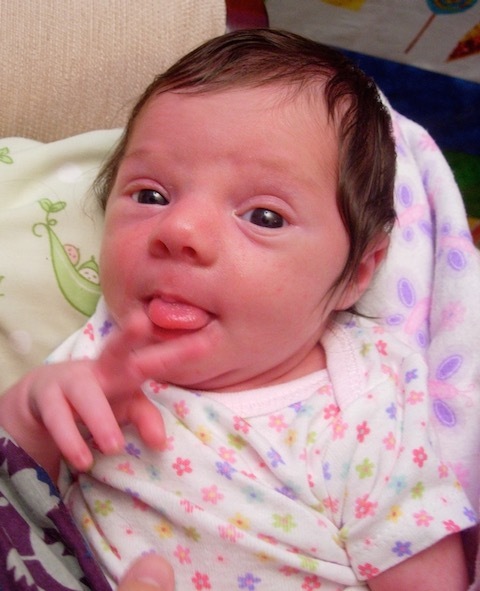 On Thursday, June 11, 2009, I awoke knowing that by the end of the day, I would be holding my new baby. I had spent an hour or two in and out of sleep with waves of contractions. When I got out of bed it was just after 4:00 a.m., so I told David to keep sleeping, and I went downstairs. I warmed up a rose and neroli aromatherapy oil. I had for a few days wrestled with some anxious thoughts, but this morning, alone with the Lord, I felt clear and uplifted, empowered and embraced. For the next couple of hours, I listened to praise music by Phil Wickham, ate a little strawberry yogurt, started some laundry, listened to Hypnobabies birthing affirmations while timing contractions on the birth ball, peeled carrots for the birth day cake, and walked around the still-dark house. Just before 6:00 a.m., I felt the intensity of my pressure waves increasing, so I decided to call my midwife, Debbie. Since the contractions were lasting about a minute and coming every five, she said that she would leave her home in Marietta right away.